For the first time in 12 months, dwelling values across Australia’s capital cities showed a monthly fall by dropping 1.9 per cent in May. Across most of the individual capital cities, dwelling values were also down over the month, led by Melbourne with a -3.6 per cent reduction in values. Over the past three months capital city dwelling values are up 0.7 per cent, the lowest rolling quarterly rate of dwelling value appreciation since the three months ending June 2013. 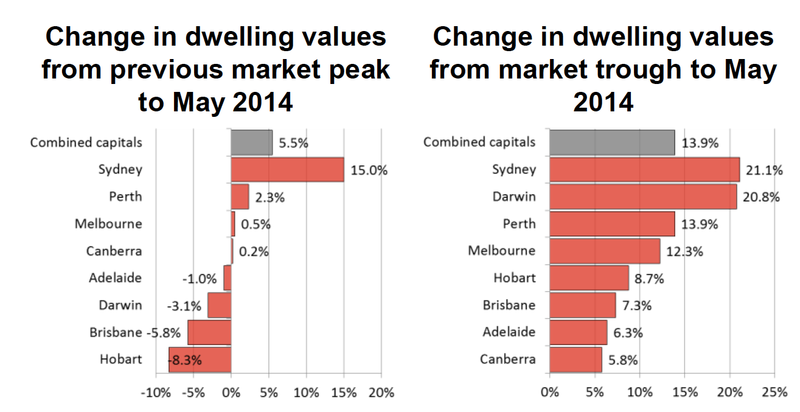 Over the growth cycle to date, which commenced in June 2012, capital city dwelling values are up 13.9 per cent. According to Mr Lawless, the surge in values has largely been driven by strong market conditions in Sydney (+21.1 per cent). “The month-on-month fall in capital city dwelling values is likely due in part to seasonal phenomenon, but may also be indicative of a broader trend towards cooler housing market conditions. Historically, housing market conditions have softened in April and May as the market rebalances from what is typically a seasonally strong first quarter and also as a results of cooler climatic conditions during the autumn and winter months. Outside of the seasonality, we have been seeing signs that the housing market is at or approaching the peak of the growth cycle. The rolling quarterly rate of growth peaked in August last year and we have been seeing weaker auction clearance rates since late February when the capital city clearance rate hit 76 per cent,” Mr Lawless said. By way of its cycle, Australia’s housing market has shown that a growth phase usually lasts around two years. Mr Lawless said that with affordability becoming more challenging and rental yields substantially compressed across Australia’s two largest cities, we wouldn’t be surprised if the growth trend moderated further over the year. A recent deterioration in consumer confidence reported in the Westpac/Melbourne Institute Consumer Sentiment Index shows that this factor may also be playing a role in the winding down of housing market conditions. According to the Index, consumer sentiment recently peaked in September last year and has since declined by 16.0 per cent. The May consumer sentiment results showed a significant fall away which can be attributed to the announcements made in the recent Federal Government Budget announcement. Current investor risk is very much concentrated within the Sydney and Melbourne markets where investor activity has been the most concentrated,” Mr Lawless said. The May RP Data - Rismark home value index results out today confirmed a fall in capital city dwelling values by 1.9% over the month which, according to RP Data research director Tim Lawless, can likely be attributed to both seasonality and more moderate housing market conditions.